Whenever a music publication makes a list of top rock albums, Fleetwood Mac's Rumours is there. While the album actually came out 36 years ago, the band is celebrating with what's being called a 35th anniversary expanded edition. 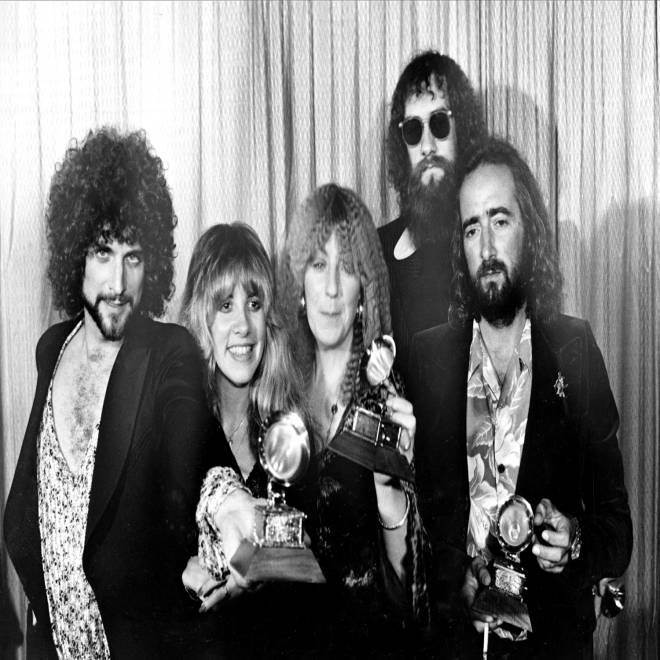 Members of Fleetwood Mac, from left, Lindsey Buckingham, Stevie Nicks, Christine McVie, Mick Fleetwood and John McVie, pose with their Grammys for "Rumours" in 1978. "We've been waiting a long time to put this out," Stevie Nicks told Rolling Stone. "If you were a Fleetwood Mac fan, you get to hear the songs turn into the songs without a lot of overdubbing. It's very simple." "Rumours is the kind of album that transcends its origins and reputation, entering the realm of legend," writes Stephen Thomas Erlewine of AllMusic.com. "It's an album that simply exists outside of criticism and outside of its time, even if it thoroughly captures its era." The album is noteworthy of course for such songs as "Go Your Own Way," "Don't Stop," and "You Make Lovin' Fun," but also for the band's own romantic turmoil as the album was being made, which bleeds through into the music. "That really was a lot of the appeal of Rumours," Lindsey Buckingham admitted in the same Rolling Stone interview. "The music was wonderful, but the music was also authentic because it was two couples breaking up and writing dialogue to each other." The band recently added more dates to their upcoming tour, which begins April 4 in Columbus, Ohio, and which will include many songs from "Rumours." Christine McVie will not be a part of the tour. In 2012, when the tour was announced, Nicks told Rolling Stone, "(McVie) went to England and she has never been back since 1998, so it's not really feasible, as much as we would all like to think that she'll just change her mind one day. I don't think it'll happen. We love her, so we had to let her go." The band's 1975 song "Landslide" appeared in Sunday's Budweiser Super Bowl commercial, one of the most popular ads of the night. Are you a Fleetwood Mac fan? What's the best song from "Rumours"? Vote in our poll, and tell us on Facebook. Was Alicia Keys' national anthem too slow?